The Heptarchy (Greek: ἑπτά + ἀρχή seven + realm) is a collective name applied to seven Anglo-Saxon kingdoms. These were: Northumbria, Mercia, East Anglia, Essex, Kent, Sussex and Wessex. The Anglo-Saxon kingdoms eventually became the Kingdom of England. The term has been in use since the 16th century. It is used to apply both to the seven kingdoms and to the time period in which they existed. 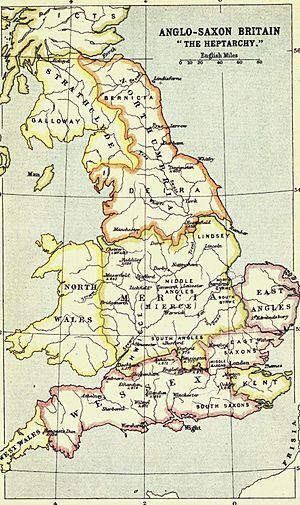 The idea of a heptarchy, a group of seven independent kingdoms, is thought to have come from the English historian Henry of Huntingdon in the 12th century. He listed the seven Anglo-Saxon kingdoms in his Historia Anglorum (History of the English People). Bede, however, set up the idea that several kingdoms were more dominant than others (at different times). He created a list of kings who dominated the other kingdoms as bretwaldas. The dividing line between these kingdoms was the River Humber. Northumbria (Deira and Bernicia) was the northern kingdom while the remaining kingdoms were those of the southern English. The actual term 'heptarchy' was first used in the 16th century by William Lambarde. His 1568 woodcut map is the earliest known use of the term. The term heptarchy is sometimes used to imply a confederacy between the kingdoms that did not exist. From the 6th century to the 9th century these were simply seven kingdoms set up by the Germanic invaders and their descendants. There was little equality between them. Northumbria, Mercia and Wessex were the most powerful of the seven and often dominated the others. The kingdoms were gradually reduced in number. The Heptarchy basically ended with the coming of the Vikings. The term heptarchy was popular among scholars from the 16th to the 19th centuries but is only occasionally used today. Heptarchy Facts for Kids. Kiddle Encyclopedia.